Kevin Axt was born in Burbank and has been a freelance musician in LA since 1982. He began studying classical guitar at the age of 13, later adding tuba, electric bass and finally string bass to his instrumental arsenal his late teens. 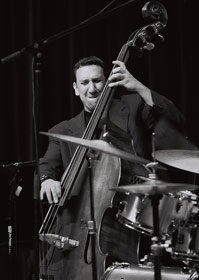 He attended USC on an orchestral scholarship studying string bass with LA Phil co-principal bassist, Dennis Trembley. He has performed, recorded and toured with artists as diverse as Natalie Cole, Jack McDuff, Jimmy Smith, Hank Jones, Phil Woods, Lalo Schifrin, Shel Lynne, Queen Latifah, Placido Domingo, Pat Williams, Russell Watson, Patti Austin, Bob Shew, Chuck Mangione, Bernadette Peters, Cristian Castro, Lea Salonga, KD Lang, Dave Koz, The Tierney Sutton Band, David Benoit, Bob Florence, Mitch Forman and Chuck Loeb, Robben Ford, Jack Sheldon, Etta James, James Moody, Christopher Cross, Cheryl Bentyne, Alan and Marilyn Bergman, Glenn Frey, and Melissa Manchester to name just a few.